The lean methodology famously started on Henry Ford’s Model T production line in the early 20th century and was formalized in Toyota factories in the 1930s. The new production method broke down the manufacturing process into very small parts, emphasized using “right-sized” machines, self-monitored quality assurance, and eased flow from one step of the process to the next. This process was outlined in the book, "The Machine That Changed the World" by James P. Womack, Daniel Roos, and Daniel T. Jones in 1990, inspiring other industries, including construction, to reimagine the lean process of production for their purposes. Starting in 1992 and continuing through the early ‘00s, construction management theorists, including Lauri Koskela, Glenn Ballard, and Gregory Howell, started to push the construction industry to re-evaluate construction processes. Koskela emphasized that lean construction, when properly executed, “would design production systems to minimize waste of materials, time, and effort to generate the maximum possible amount of value.” The priority of all lean construction is to keep construction crews productive, reduce waste, and reduce unnecessary materials and tools. Lean construction emphasizes arranging the supply chain, so there are no unnecessary breaks when working on a production, to increase flow on a construction site. Construction managers design the facility and the delivery process together — necessarily taking a top-down approach to evaluating and planning a project. Instead of looking at a job microscopically to identify waste areas, they focus on improving the process of the entire project. And instead of relying on a calendar, construction managers balance pulls and pushes based on the demands of the project — doing away with the communication problems of centralized, far-off management. All aspects of the project are monitored, measured, and improved upon, largely with the help of construction management software. Managers encourage face-to-face communication daily to eliminate communication problems. When figuring out the specifics of a job, they define value from the customer’s perspective and take an iterative approach to their work processes to continually eliminate waste. Finally, all members of the construction team are equally accountable for the success or failure of the project — and receive a balanced share of the final project’s profits or liabilities. 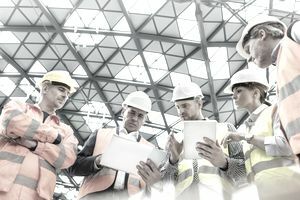 While these difficulties may be prohibitive to some firms, construction managers should remember that lean construction is a philosophical approach to construction — there isn’t a “right” way to do it so long as the guiding principles stay true to eliminating waste, specifying value from the customer, emphasizing workflow, allowing for customer pull, and aiming for perfection.